We are a local, non-profit, 501(c)(3) organization serving our community. Our organization is ran entirely by volunteers and is overseen by a Board of Directors. To assist with our mission, we contract with a veterinarian and a vet tech at our Low Cost Spay Neuter Clinic. We are your friends, neighbors, local businesses and corporations, all striving to advance the humane treatment and understanding of all animals in Madison County. We are members of the Richmond Chamber of Commerce and the Berea Chamber of Commerce. So, what is it that we do? Our current programs are focused on reducing pet overpopulation (thereby saving lives), by promoting Humane Education in our school systems and encouraging spaying and neutering with our Spay/Neuter Discount Program and our Low-Cost Spay/Neuter Clinic. Our No-Kill Adoption Program is a foster-home based rescue network utilizing volunteers to keep pets safe until they are permanently adopted. Additionally, through our Information Networking, we can help those having an animal-related issue of any kind, whether it be by offering advice and information, referring services, or sometimes simply by lending an ear. We are not affiliated with the Humane Society of the United States (HSUS), Peta, the ASPCA, or any other organization. These are all large organizations that address animal welfare issues on a national level. If you donate to those organizations, that is all well and good, but your donation to them will not support the Humane Society Animal League for Life. We are a local nonprofit organization serving our community and our organization is ran entirely by local volunteers. We do not provide formal animal control services and do not employee animal control officers. 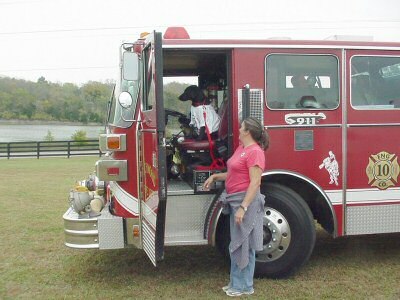 In Madison County, KY, animal control is handled by the Madison County Animal Shelter, a separate authorized agency. Murphy, our Mascot, thinks he can handle this big rig.